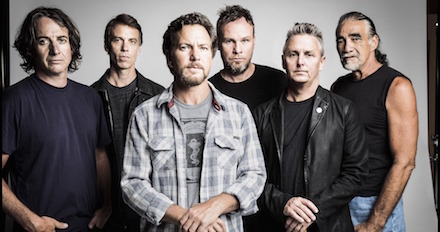 Pearl Jam is a rock band from Seattle. They have sold over 60 million records worldwide and they have been inducted into the Rock and Roll Hall of Fame. "It's about him [Tillman] and a bunch of the guys who didn't get as much coverage—the guys who barely got a paragraph instead of ten pages... The thing about Tillman was, he got ten pages but they were all lies. His family is being blocked by our government from finding out what happened... Where are the leaders that are going to represent a galvanized view on what to do next?... Democracy might have a chance at working if people educate themselves on these issues and make their opinions known." I felt the earth on Monday. It moved beneath my feet. In the form of a morning paper. Laid out for me to see. Saw his face in a corner picture. I recognized the name. Could not stop staring at the. Face I'd never see again. It's a shame to awake in a world of pain What does it mean when a war has taken over It's the same everyday in a hell manmade What can be saved, and who will be left to hold her? The whole world...World over. It's a worldwide suicide. Medals on a wooden mantle. Next to a handsome face. That the president took for granted. Writing checks that others pay. And in all the madness. Thought becomes numb and naive. So much to talk about. Nothing for to say. It's the same everyday and the wave won't break Tell you to pray, while the devils on their shoulder Laying claim to the take that our soldiers save Does not equate, and the truth's already out there The whole world... World over. It's a worldwide suicide. The whole world... World over. It's a worldwide suicide. Looking in the eyes of the fallen You got to know there's another, another, another, another Another way It's a shame to awake in a world of pain What does it mean when a war has taken over It's the same everyday and the wave won't break Tell you to pray, while the devils on their shoulder The whole world... World over. It's a worldwide suicide. The whole world... World over. It's a worldwide suicide.